It's Writing Wednesday. 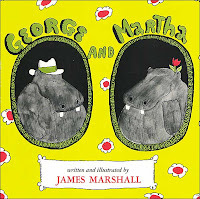 James Marshall (here on Wikipedia) was loved for his humorous books with delightful pictures. Some folks (who happen to know a lot about children's books) got together to talk about James Marshall and humor in children's books. Here is a link to watch this discussion at MIT. It's long, so be prepared to settle in, but it's also quite interesting. It's a nice opportunity to see an important picture book creator discussed thoughtfully and with affection.